With the formation of Telangana state on 2nd June 2014, once neglected customs and traditions of the people of Telangana has come to the forefront with pomp. 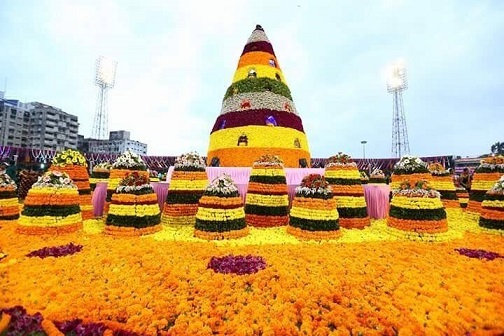 The nine-day celebration of Bathukamma, is poised to become the face of the new found Telangana identity. The literal meaning of Bathukamma is “Come Alive Mother”. But there is much more to the festival than its literal meaning, that defines the people of this Telugu speaking state. 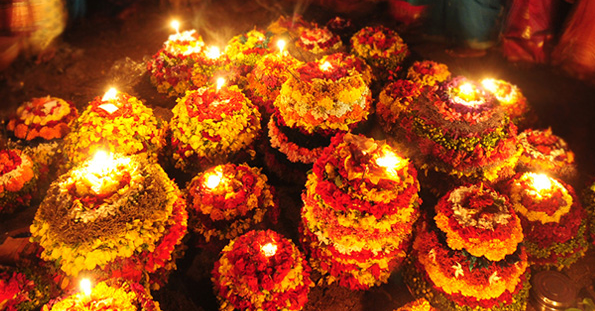 Bathukamma commences on the first day of the lunar month of Aswayuja and ends on Mahanavami, one day before Dussehra. Though there are many legends and historic incidents behind the birth of this celebration, at its core every celebration brings smiles and happiness in the hearts and minds of people. It unifies people and communities and spreads goodwill. Bathukamma achieves what a festival stands for; by all means. All Hindu festivals are either the celebrations of abundance or victory, but academics have a slightly different view about Bathukamma which may contradict the popular notion. The present day Telangana region was under the authority of Chalukya King, Satyaasrayudu who was the King of Vemulavaada . Rajendra Chola, son of Chola King Raja Raja Chola defeated Satyaasrayudu in a battle both fought vigorously. The victorious Rajendra Chola took two huge Siva Lingas from the Rajeswara Temple in Vemulavaadu and installed them at the newly built Brihadeswara Temple in the Chola Kingdom. Brihadeswara temple was built from the wealth looted after defeating Sayaasrayudu. Raja Rajeswara Temple was a popular temple in the region and taking away the Shiva idol saddened the Telangana people. People believed that separating Parvati from Shiva, saddened the Goddess too. The ritual that began as an attempt to console Parvati ( Bruhadamma) and to inform their sorrow to the Chola King, took the form of a festival as time passed. Bathukamma, the name was derived from Bruhadamma which is another name for Parvati. But connecting a historical incident with the festival is purely based on assumptions. The victory of Rajendra Chola and the removal of the idols are part of history. But the birth of the festival from that historical event is substantiated only by the absence of evidence for Bathukamma origin. There are many legends, but the one that stands out because the festival coincides with Navratri celebrations is the story of Goddess Gowrie (Sakti). After killing Mahishasura – the demon, the Goddess went into deep sleep due to fatigue on the ‘Aswayuja Padyami’ day. Gods and devotees prayed wholeheartedly for her to wake up and as a result Goddess Gauri woke up on Dasami day. Bathukamma is celebrated to mark the occasion. Another story is that of Chola King Dharmangada and Queen Satyavati who lost their hundred sons in the wars they fought to save their kingdom. The royal couple prayed Goddess Lakshmi to bless them by taking birth as their daughter. Goddess Lakshmi granted their wish and the baby girl was named Bathukamma. The festival marks the joyous occasion. Offering flowers to God is an important part of Hindu worship. ‘Puja’ is the name used to denote the ritual performed by Hindus to worship God. There is an argument that the origin of the word ‘Puja’ has roots in Dravidian languages and the meaning of Puja is, ‘to do with flowers’. There is nothing to replace flowers, as it is natural, beautiful, has fragrance and purity and is available in the nature as a blessing from almighty. Something that best symbolises God. 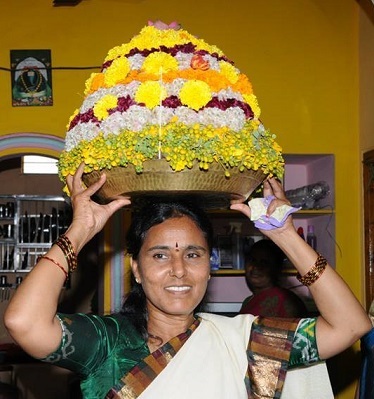 Bathukamma festival is celebrated by women. In Hindu ideology, women are dignified representations of Motherhood. Goddess Shakti is the ultimate representation of the same concept. In Advaita doctrine, soul of a person is the same as the highest metaphysical Reality and its feminine version Sakti. The only barrier that separates the two are the physical body. The offering of the pure, delicate flowers to the Goddess is an attempt to overcome the impurities of mind and body, to dissolve in the pure ultimate and infinite Brahman or Sakti. It is a process of self-realisation. 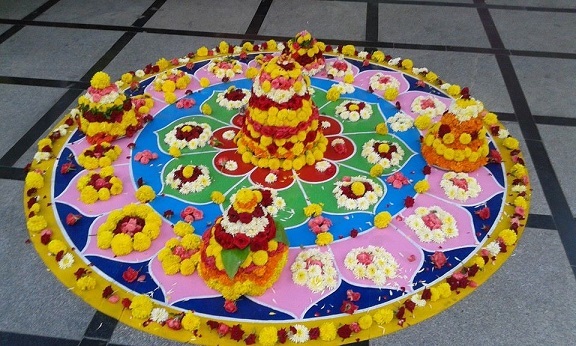 During the festival women of the house arrange flowers in the shape of a Gopura or cone on a platter of reeds or bamboo or brass in seven layers. The different types of flowers used for the floral arrangement are, ‘Tangedi’, ‘Gunuka’, ‘Lotus’, ‘Alli’, ‘Katla’ and ‘Teku.’ On the top a Pumpkin flower is kept over which Goddess Lakshmi made with turmeric is placed. This is called Bathakamma. Preparing Batukamma is an art all women learn to master. The final day of the Bathukamma is Saddula Bathukamma. The preceding eight days’ women folk make small Bathukamma. In the evening women gather in large numbers with their Bathukammas in open areas, forms circle around Bathukamma and engage in singing and dancing around it. After this Bathukamma is immersed in the nearby waterbody. The ninth day on Saddula Bathukamma, the whole family engage in making the Bathukamma in one way or the other. Men and children collect flowers from around and the entire household sit down to make the Batukamma that befits the Grand finale of the celebration. Nowadays as multistorey buildings and flats replace houses, as backyards and gardens vanish, most buy flowers from the market for the occasion. As time and situations change the real fun our previous generations had in celebrating these festivals gradually fades away. 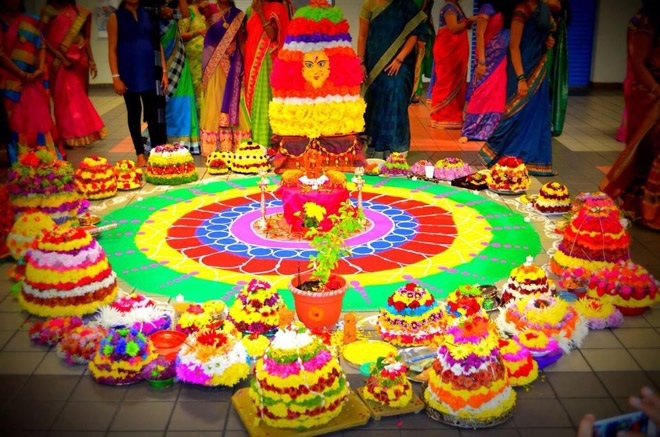 Once the Bathukama is made, the women of neighbourhood also gather in a large circle around the Bathukamma, singing songs by circling it repeatedly, building a beautiful human circle of unity, love, sisterhood. By evening, the women folk carry Bathukamma on their heads and move as a procession towards a water body like lake or river. The women and girls dress in their colourful, traditional clothing’s, sing songs of folklore in chorus throughout the procession.